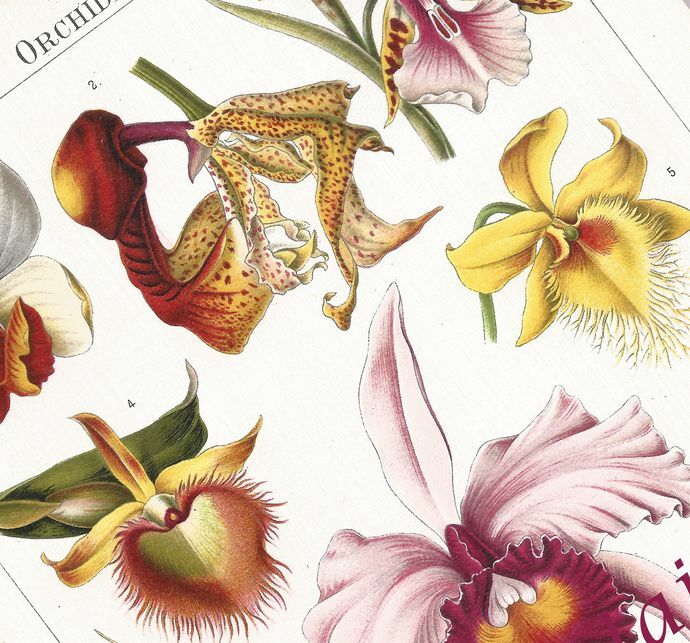 From a discarded 1885 discarded Joseph Meyer Konversations encyclopedia, here is a beautifully bright German antique engraved botanical chromolithograph featuring one dozen gorgeous, detailed orchids. Brilliantly vivid and bright, the 12 floral motifs are featured on a heavy paper. Blank on its reverse, the paper measures 6.25" x 9.375" (15.9 x 23.8 cm) and, with its protective rice paper tissue safely attached, very little tanning is seen. 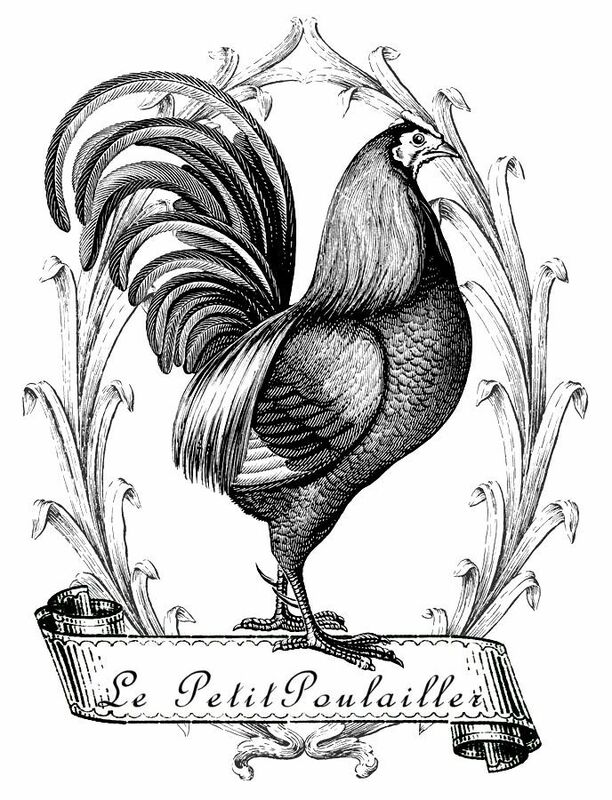 The paper is clear and bright, the chromolithography is strong and bold, and there are no tears, folds, creases, or marks. Twelve lovely images to frame for your home decor - bedroom or studio, dressing room or bath ... or will these make their way into your art - tag and card creations, collage, scrapbook page making. Frame and gift to the gardener you adore. 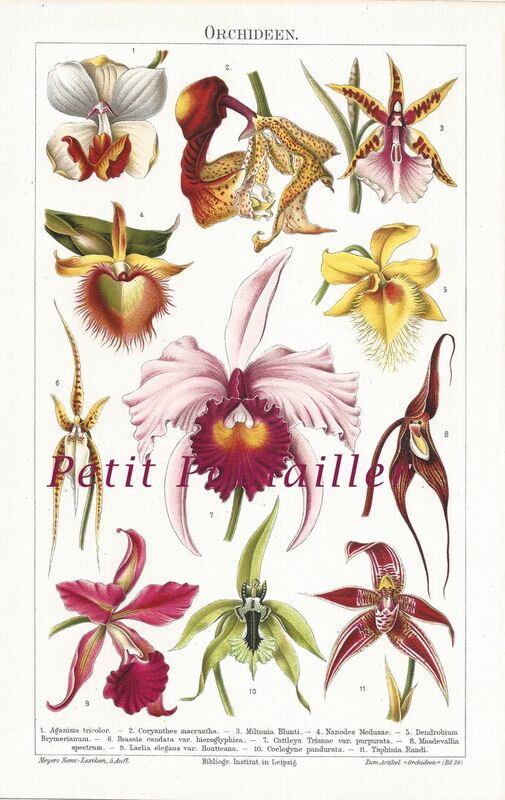 You are purchasing an 1885 original paper and it does not have watermarks. I will send this to you flat, protected, and by USPS 1st Class mail.